Pounding Pep, beating Benitez and lambasting Luis. A hall of fame journey, man that'll be good. Join Juan Martinez as he journey's around Europe with the hopes of emulating Pep Guardiola, Rafa Benitez and Luis Enrique and top the hall of fame for Spanish managers. I've had difficulty settling into my last 2 saves on here, my Slavic country one had a bug in the added on database and now I can’t get into my North & South America save at the minute. Anyway I'm going back to my original idea of a hall of fame save that had encountered a bug and I am still waiting to see if that gets fixed. Until it does here is my latest attempt at a long term save. 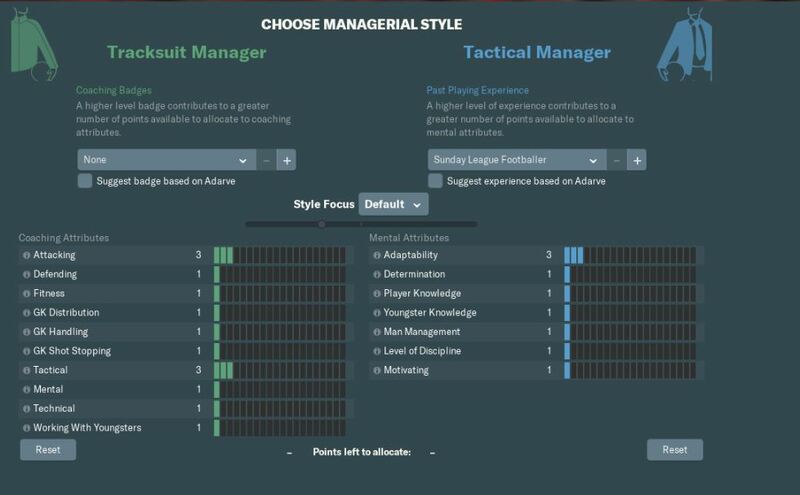 Fingers crossed there's no issues with this one, if there is I am going to go back to my FM17 save that I still have which you can find here. This thread is going to be along the same lines as my previous thread, which you can find here. 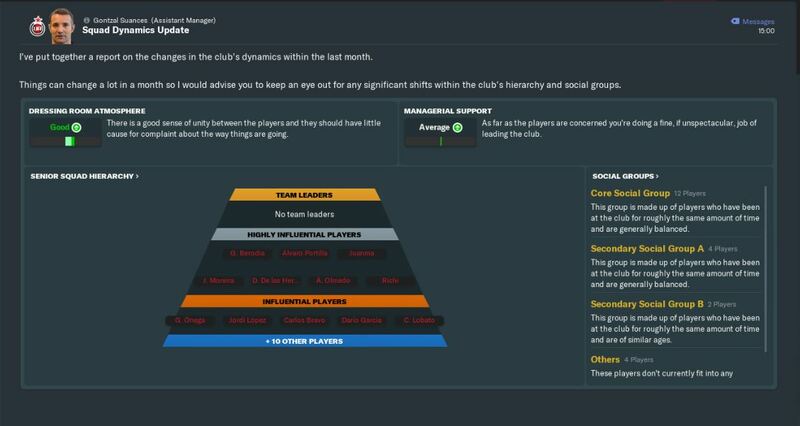 Whilst the concept is the same, the leagues loaded at the start are slightly different. At the start of the game, for Spanish managers that are currently in the game, Pep Guardiola, Rafa Benitez (my hero) and Luis Enrique sit 1st, 3rd and 7th in the Spanish nationality hall of fame respectively. Between them they have 13 league titles, 9 domestic cups, 15 other club trophies but no international trophies. Also at the start of the game, for the nation of Spain's hall of fame, Pep sits 4th, Luis Enrique sits 8th but Rafa the Gafa finds himself omitted from this list. As with my previous effort I will be starting at a specific club, however I will have no coaching badges and a Sunday league rep. I will probably add / remove leagues as I go. As my rep hopefully increases I do want to manage in Italy and Poland again so these will be added later I think. The leagues of Denmark, Hungary and Norway are there to add a bit of variety to the save. 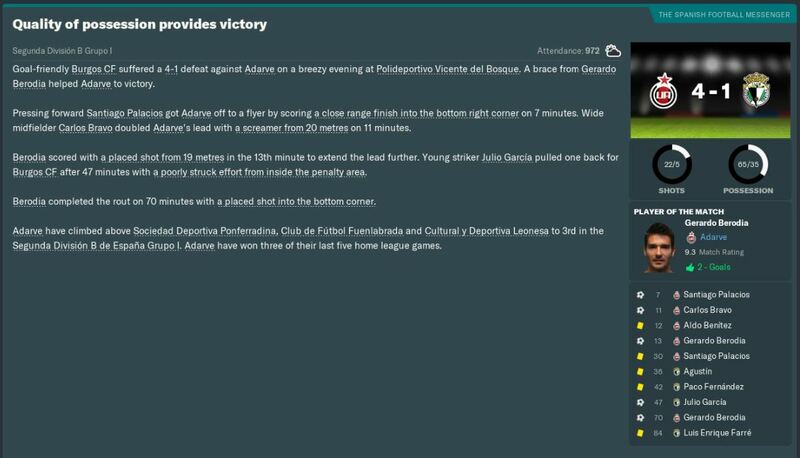 The aim for this save is for a Spanish football manager by the name of Juan Martinez to go from a modest upbringing in the Basque city of Bilbao (unfortunately you can't add Basque as your own second nationality) and journey to hopefully many places to become the best Spanish football manager ever. A failed student of the famed Athletic Bilbao youth academy The Cantera, he has a chip on his shoulder to not only succeed as a manager where he failed to as a player, but to get back to the club that released him as a youth prospect and let bygones be bygones and hopefully bring success to Athletic Bilbao. Whilst being from Bilbao, his parents are both Portuguese, so he has a long standing love for Sporting Lisbon the club his father supported all his life. Whilst he aims to get back to Bilbao eventually, the thought of managing Sporting is always at the front of his mind, so this is also 1 of his goals in his career. The overall aim for this save is to top the hall of fame for the nation of Spain as well as Spanish managers. To do this Juan must start at the bottom and claw his way to the top. He wants to be spoken about in the same light as Pep, Rafa and Enrique and he has the right mentality and attitude to achieve that. This is the story of 1 Bilbaíno leaving the comfort and lifestyle of the Basque country for now as he sets off on a European journey, man this is going to be good! So starting at a specific club and to make things as realistic as possible, the club is UD Adarve, a small club in the big city of Madrid. 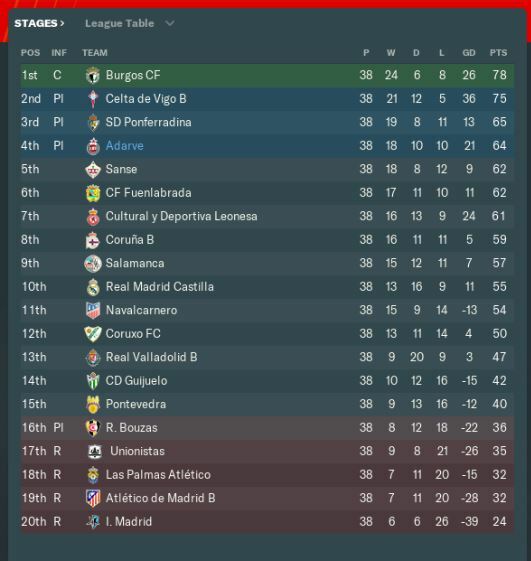 We are expected to finish near the bottom of the table, and if nothing else staying in this division will be seen as a great achievement in my first season as a manager. 1 positive from my first day here is that we have an affiliation with Atletico Madrid. Whilst this link allows Atletico first dibs on any of players, I’m hoping we can secure some loan signings from them in the future to help our chances. 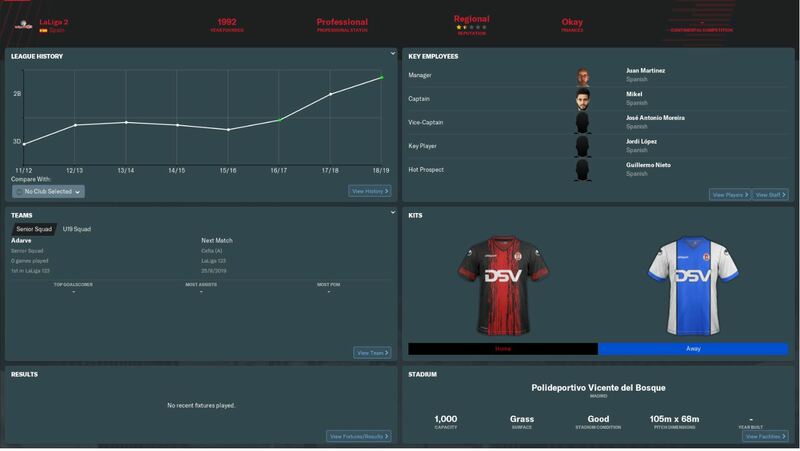 A club with next to no history as they were formed as recently as 1992, the potential is definitely there for me to improve both this clubs fortune and my own journey to the top. As I introduce myself to the players, I’m met with a group of people that act as if they don’t want to hear what I’ve got to say. I tell the team I’m confident we can avoid relegation, they all disagree and say there’s no chance we’ll avoid relegation. I’ve got a hell of a battle on my hands to win these guys around. And what a performance! Despite it being a pretty even game we never looked like coming out of this as the losing side. 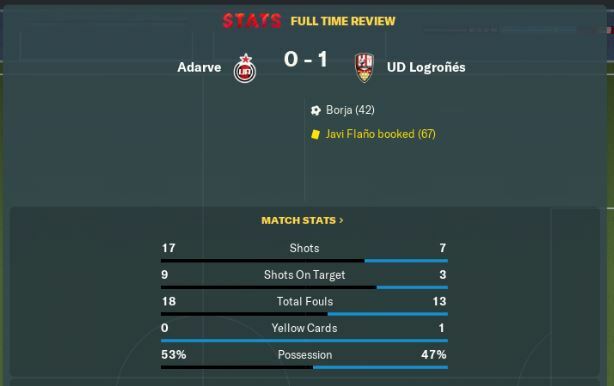 A great result in my first game in charge. 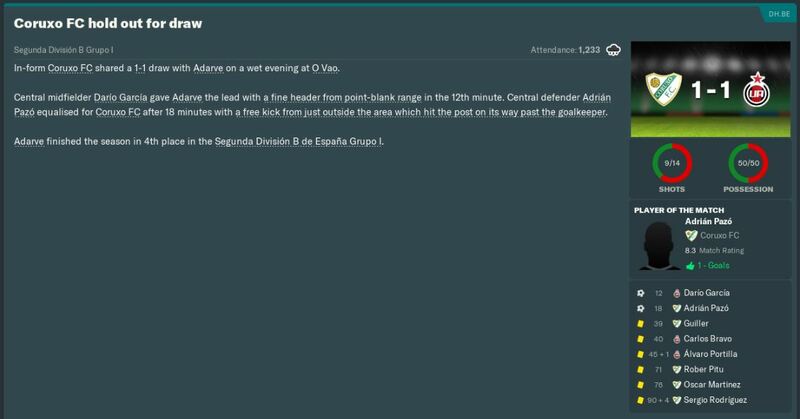 Back to back 1-1 draws now as we took on Salamanca & Real Valladolid. Despite us drawing these games I’m happy as we’re unbeaten in our first 4 games. 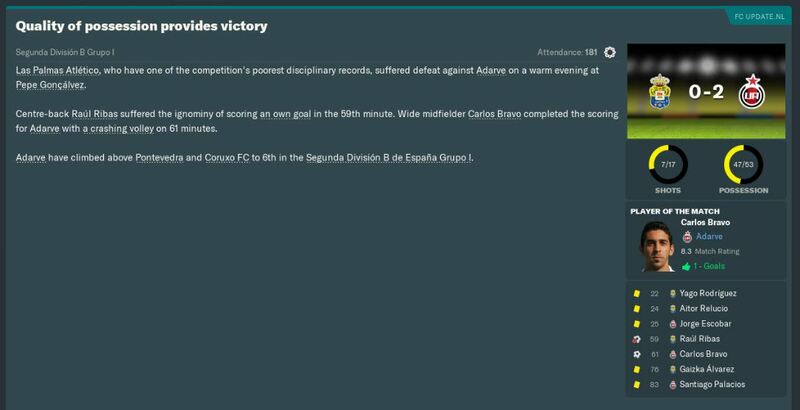 We finished my first month in charge with 2 defeats, the first away to Navalcarnero and then 2-1 at home to Celta Vigo’s B team. Whilst not the best form to end my first month in charge but our record after 6 games is 2 wins, 2 draws and 2 defeats, we find ourselves 9th in the league. At first my tactical approach will be 4-4-1-1 counter attacking in away games and then we set up 4-2-3-1 in home games. It’s kind of worked so far as we’ve played well using both tactics. I will see how we get on going on from here. 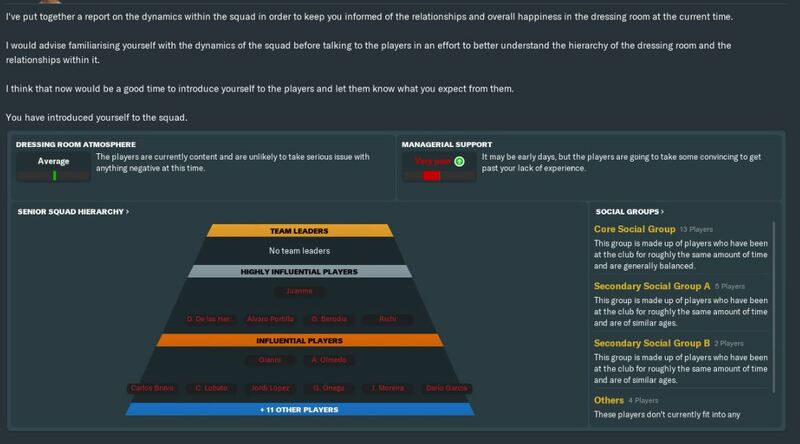 I’ve also not signed anyone as there is zero transfer budget and the team I have is the team that is there from the start. Final note of point, confirmation that the UK will be leaving the EU at some point in my save, I'll see how that progresses. Next update will be the next month or 2 worth of games and if anything else comes up. Thanks for reading. Unfortunate about all the other saves. I really liked the Lisbon one and I miss that the most. 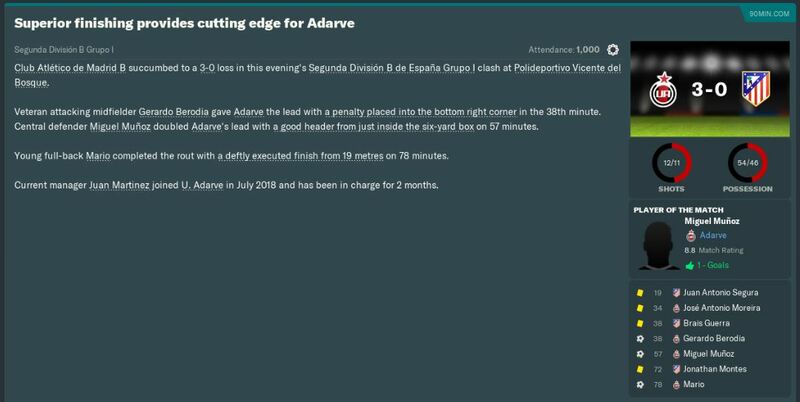 Cheers for the support man, I'm still gutted about my Lisbon save experiencing the bug, SI are still looking into it but nothing back as yet. Maybe just maybe it gets resolved by the next patch and I can continue that save. At least there's a chance of it returning. really enjoyed the Lisbon one so gutted to see it go. I like the Spanish leagues though so this will be interesting. Count me in as always! Me too man but there's a slim chance it may get resolved, however thanks for being on board as usual! 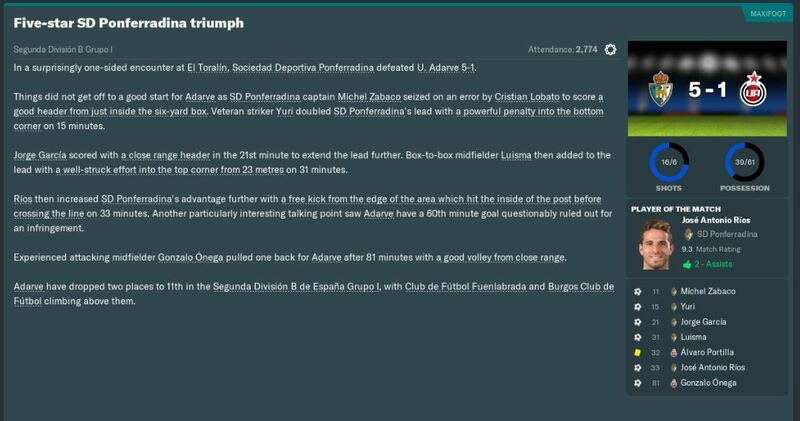 Well, thanks to Laboto’s promise of a good showing he helped us get beat 5-1 away to Ponferradina! I don’t like changing a winning side and this shows exactly why! Next up was Guijuelo at home and what. A. Game! We were down 3-1 after 60 minutes but got back to 3-3 by the 65th, however we pressed pushed and battered them all the way right up until the 92nd minute when left winger Portilla buried a shot in at the near post. Absolute scenes! Oh and Laboto didn’t play in this game! At the end of the month we’re sitting in the dizzy heights of 6th in the league, the board are happy and the players are just about on board. 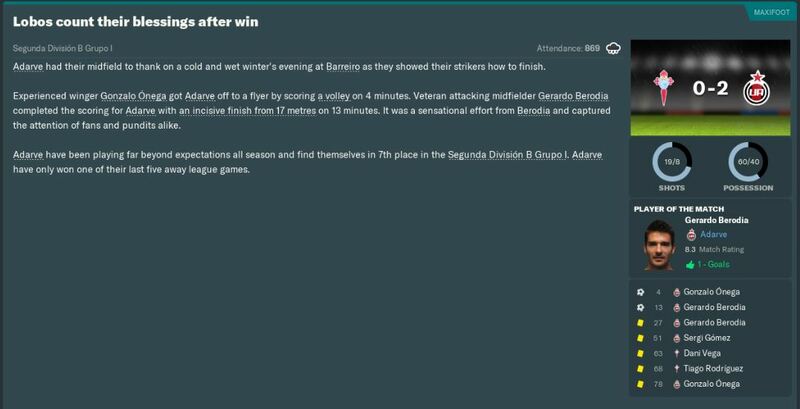 November carried on where October left off as we battered Pontevedra 4-1 in yet another fine showing after going 4-0 up in the first half. How this team were expected to finish near the bottom of the league is beyond me! 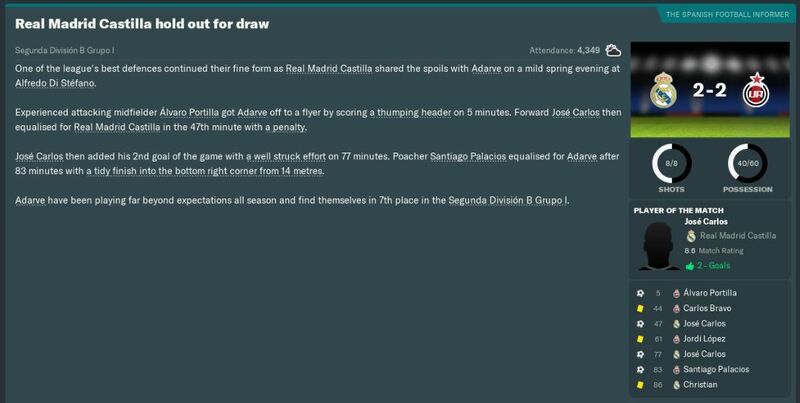 An absolute barn stormer of a match next as we shared the spoils in a 4 all draw at home to league favourites Deportiva Leonesa. Neither of us really concentrated on defence as this was as end to end as possible. Whilst I’m happy we can score goals we do look shaky at the back, something to keep an eye on. Finishing off December we went down 1-0 away to Sanse in a poor game for us. We go into January 7th in the table though and really, considering where we were expected to be this is a good place. Our first game of January and we went and beat Coruxo 3-1 at home and we played well. After that game it’s announced that I am currently rolling with a 50% win record! I knew we have been playing well but didn’t realise we’d won 10 of my first 20 games in charge! Definitely think we can grab a play off by the end of the season at this rate. 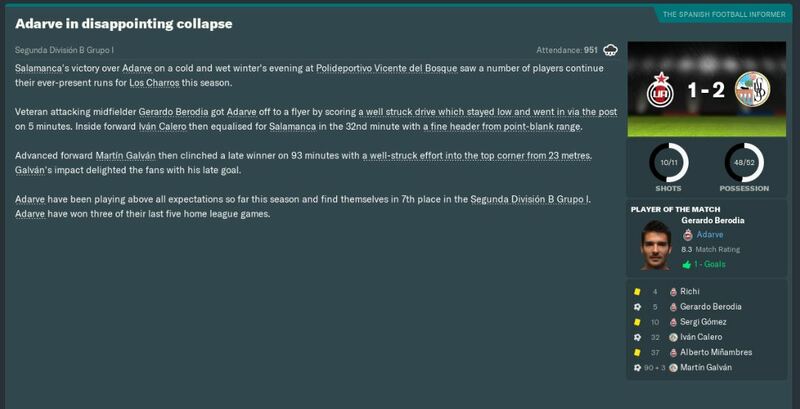 Finishing the month on a low point now as we went down 2-1 to Salamanca. 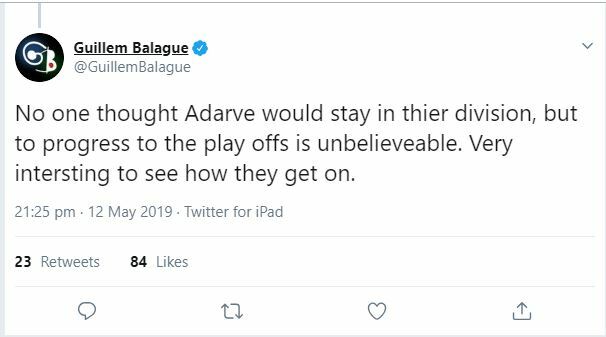 It’s not quite panic stations yet as there’s plenty of time left in the league and I’m not worried by this 1 loss although it could be argued they were very, very lucky to grab that late winner but it is what it is. So we finish January 7th in the league and that’s not bad really. I’m confident relegation isn’t ever happening and we can aim for the play offs. I’m surprised where we are at really as I was gearing up for a long season near the bottom of the league. Next update will be the next few months of the season in the run up to the end of the year and any other business. Thanks for reading, it is much appreciated! A good challenge that you are doing here. I will certainly follow. The 8 points of the first one is not that it is a lot but also not a little.. anything can happen .. do you think that you could climb up a few more places? Good luck mate. Wow, decent season so far. Can you close the gap at the top? I think you can give it a good go. Best of luck! Thanks for being on board man, much appreciated! I'll be happy with a mid table finsih at the start of the season but we've been surprisingly good so far. It's a tough ask but you never know dude! Update should be up today or tomorrow. I've done quite a bit on this save over the weekend and will have at least a short update up today, I;m at work so it may be tonight I get it done. However I will definitely have something up today. 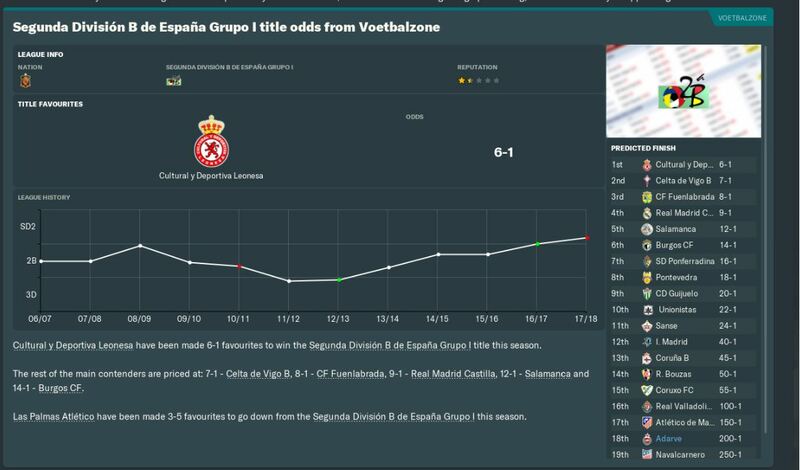 We’re kicking off February with a 0-0 away to Real Valladolid in a game they absolutely dominated. I’ll gladly take this draw after barley being in the game at all. Another 0-0 followed this one at home to Navalcarnero. Not much to say on this really as it was an even game and a draw probably suits both teams. 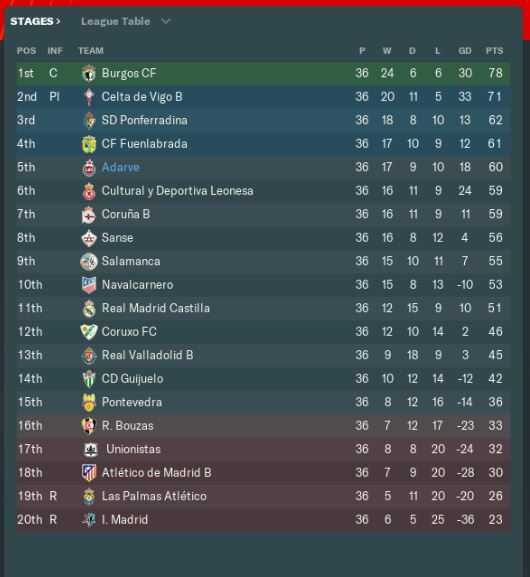 We manage a good win away to Celta Vigo B before rounding the month out with a loss away to Fuenlabrada to give us a record of 2 draws, 1 win and 1 loss in February which keeps us in 8th in the league. 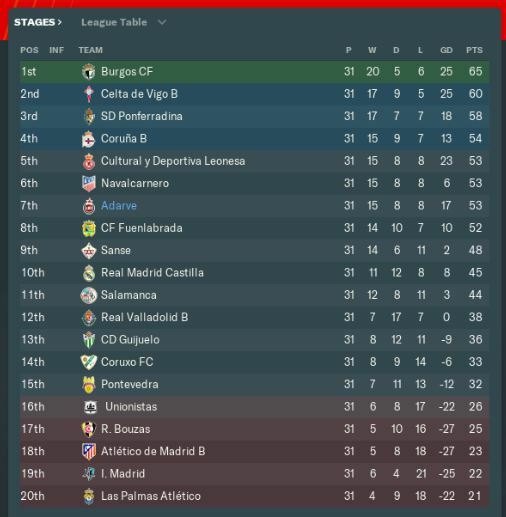 March started off really well as we recorded victories over Ponferradina (2-0), Guijuelo (1-0) in a game we were extremely lucky to win and Las Palmas B (1-0) before going down 1-0 to Pontevedra (1-0) before rounding out the month in an entertaining 2-2 draw with Real Madrid Castilla. We’re sitting 7th in the league with 7 games to go. A top 4 finish is definitely on the cards if we continue picking up points. Whilst the results have been good, the performances in some games have left a lot to be desired. The Guijuelo game was literally attack versus defence as we nicked a goal from a corner and weren’t ever really in the game apart from that. I’m happy with where we are. We’ve not ever thought about relegation and have the playoffs in mind. Also a final point on this is that I’ve signed a contract extension. The 20% release fee is there just in case someone comes in for me, highly unlikely this early into the save though. Next update will be April & May's round of games, how we finished up at the end of the season and any other business. The final run in and play off push starts of away to Inter Madrid who are looking more and more likely to get relegated. We put in another showing off grit and determination as we won 2-0 in a game they dominated shots but we never looked like conceding. 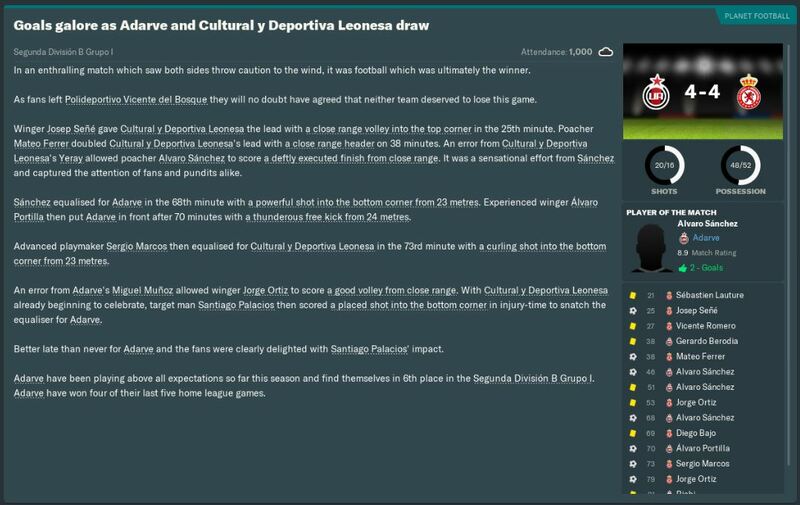 The play off push took a hit as we went down 1-0 at home to Deportivoa La Coruna B in another even game. Hopefully this loss isn’t a sign of things to come. 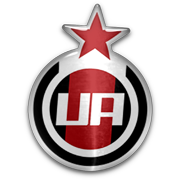 It wasn’t as we battled to a 2-1 home win over Unionistas. We went 2 up after 18 minutes but conceded not long after. We held on for the win which could be vital. 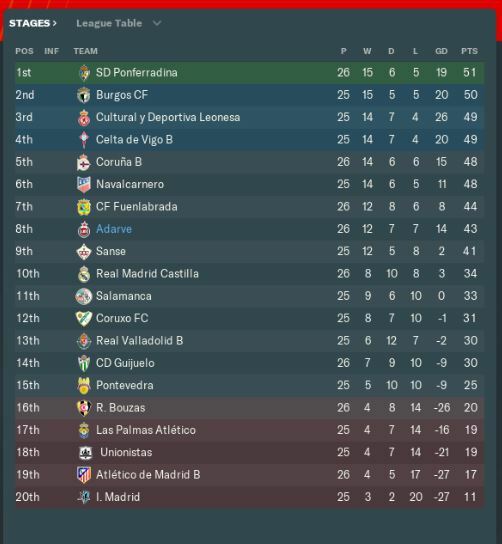 We finished the month off with a 0-0 away draw at Deportiva Leonesa and a 1-0 home loss to Sanse (I didn’t get a screenshot of this) to leave us in 5th place with 2 games to go. We’ve got 2 games to go in the league, and a play off position is at stake. Our first game of the final 2 is at home to Burgos who have just been confirmed as champions. 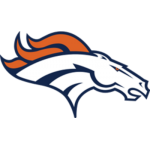 Can we get a result against the champs? Yes we can! They certainly did their bit to help us on the match preview screen they were giving league debuts to 3 young players. I’m not complaining it certainly helped us out! Final game of the season now and we’re away to Coruxo and if we lose here we’re going to be relying on other results to see us into the play offs. We did it! We’re in the promotion play offs! A draw in a game we dominated shots but had an equal share of the ball. I’m absolutely buzzing at this, I can not actually believe we’ve made the play offs with this team who were expected to finish bottom of the league! 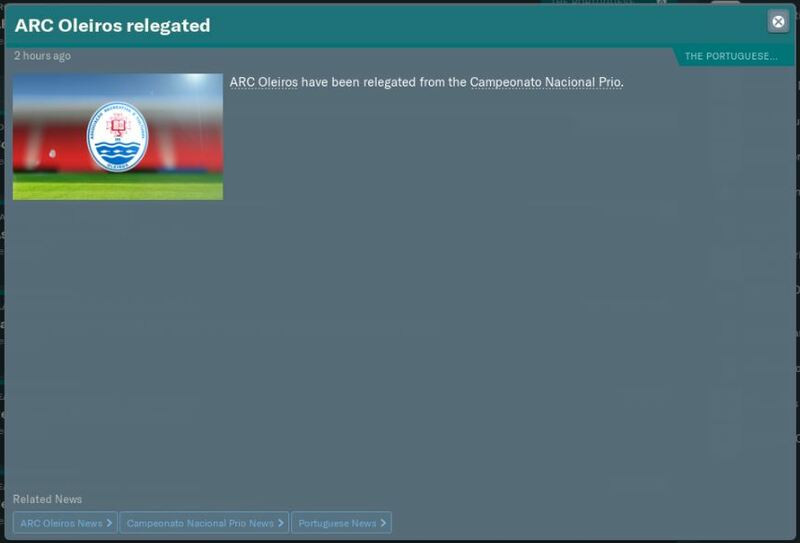 Last point on this update is that ARC Oleiros have been relegated. 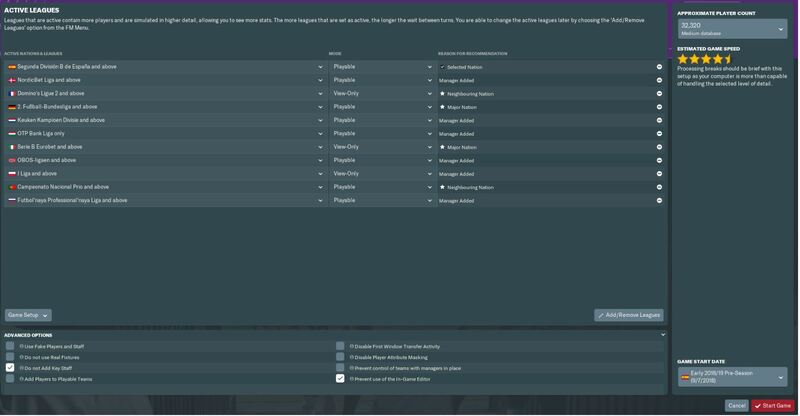 This is notable as I wanted to manage them in this career, and it’s going to be at least another full season before I can get the chance, that’s firstly if they get back up at the first try, I am unemployed and if they don’t have a manager themselves. 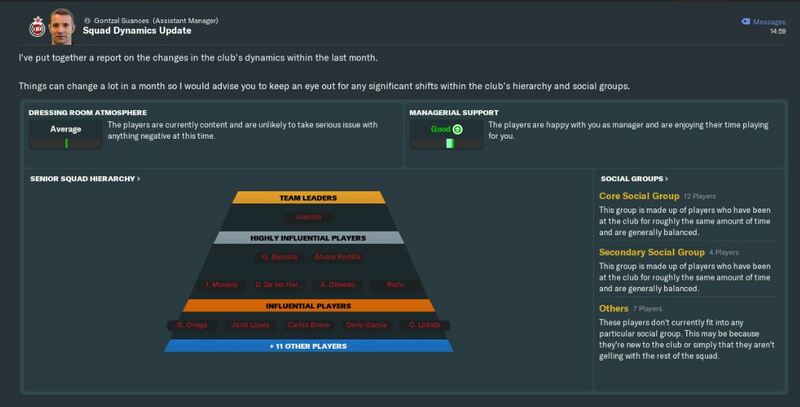 Next update is going to be how we got on in the play offs, end of season stuff and anything else of note. I walk to the dugout in our home stadium, fans have packed every corner, my heart actually skips a beat. What on Earth are we doing here?!? How did we achieve this, the play offs?!? 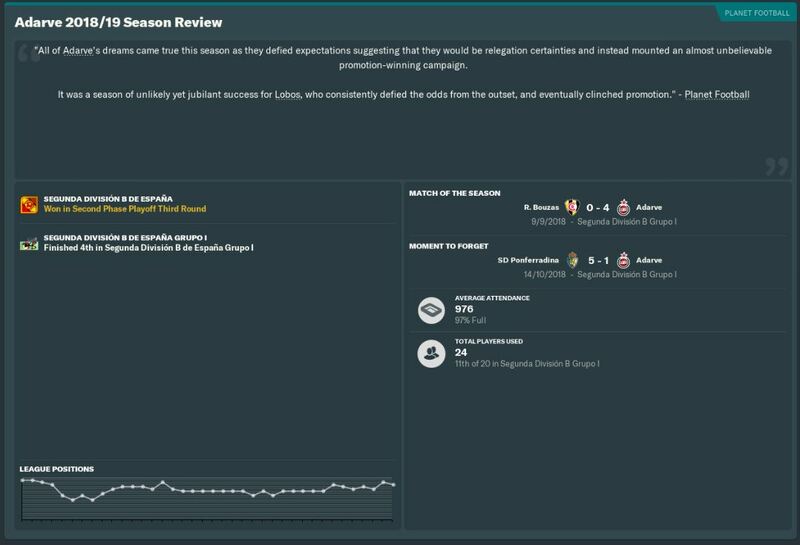 We should be battling relegation, not battling for promotion! My team has definitely upset the apple cart so to speak. Let’s upset the cart again! 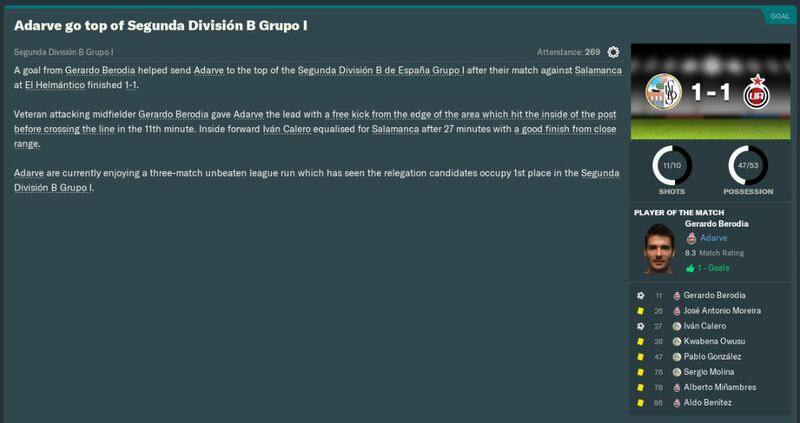 We take on Real Murcia who are in Group 4 of the Segunda league and they finished runners up. We’re going to have to be at our best to get anything from this game, I’m not going to get carried away, not yet anyway, but I’m quietly confident of getting something from this game. The second leg is so much different from the first. They absolutely took it to us, and I mean took it to us. They were all over us from the first minute, but our counter attacking set up paid off, as did our set piece training as we got another goal from a corner yet again. The aggregate score of 2-0 flattered us really as Murcia were definitely the better team over the 2 legs. 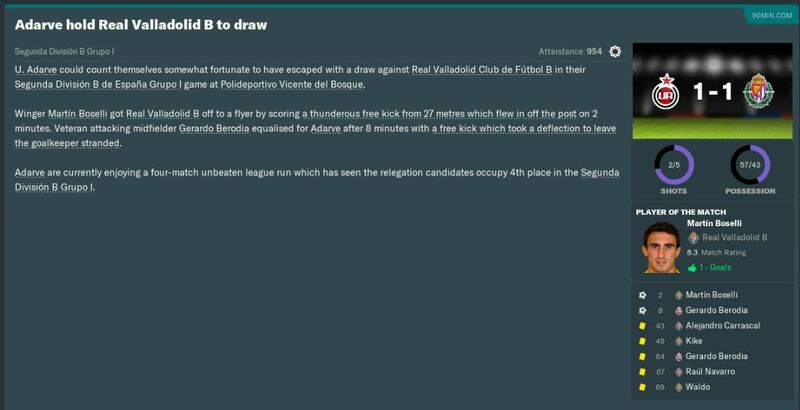 We’re in the next round of the play offs and we’re drawn against Levante’s B team. We’re drawn as the home team again and we’ll set up to try and get them on the counter attack, it’s worked so far so fingers crossed it works again. The game itself was pretty even. We did hit them on the counter in the 22nd minute and took the lead with a well placed shot. 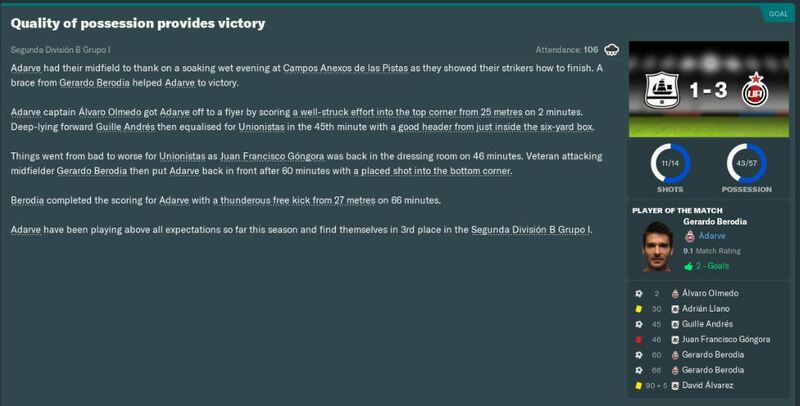 We added a second late on with an absolute worldie of a free kick, whilst Garcia got a red late on we held on to give us a good 2-0 going into the second leg. The second leg was again an even game, and despite going behind early on we held on to the lead and against all odds have progressed to the third round of these play offs. I’m not getting carried away, we’ve rode our luck so far and really we’re lucky to be where we are. The second leg loss to Levante should serve as a warning sign to us. We’ve got to step it up if we’re to progress. We’ve got UD Legrones at home next. This is what I’m talking about when I say we need to step it up. We were the better team here all over the pitch, however we just didn’t take 1 of our many chances. They did and they’ve got a 1 goal lead going into the second leg. The day before the second leg of the third round of the play offs, this is our most defining moment of the season. 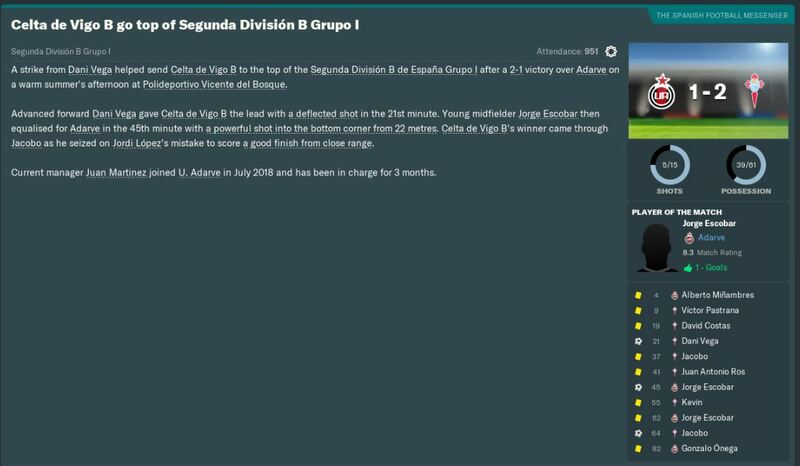 The winners of this round are promoted to the next division, the La Liga 123. I’m sat formulating a plan, do we go and try and get them on the counter? Do we take it to them? Do we go 4-4-1-1 or 4-2-3-1? Whatever we decide on, whatever the outcome of this game we can be proud of where we've got to. This is a team that should have been propping up the league, yet here we are on the verge of promotion. We've just got the small matter of a 1-0 deficit to turn over. Dare we dream, dare we think the impossible could happen? Could we do it? I had a feeling. A strange, uneasy feeling in a way, but a feeling nonetheless. I had this feeling that some how, some way we were going to win this game. I tell the lads to go out there and take it to them from the off. Whilst I know we would look back with disappointment should we not see this through, I tell the lads the pressure is all on the opposition and to play our natural game. Within the first 2 minutes we’ve already levelled the scores on aggregate. 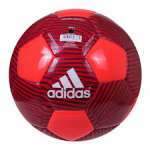 The ball came over the top and fell to left winger Portilla just outside the area and hit the ball, and my word it stayed hit! This is it, I can feel it, we’re going to win this game. UD Legones equalised with a volley that was straight out of the top drawer. They crossed it in and it just fell kindly to their winger who buried it. 1-1. Straight from the kick off we went at them and lady luck was smiling down on us as we got another goal to put us 2-1 on the night, 2 all on aggregate. 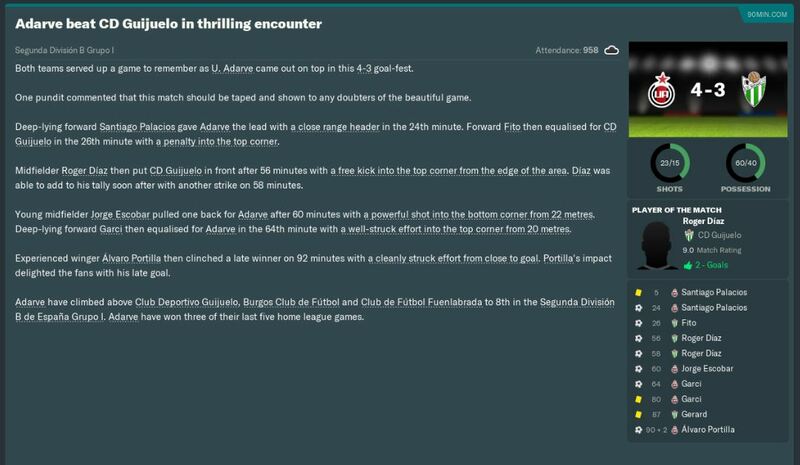 The game finished 2-2 but thanks to the away goal rule, we won the tie! 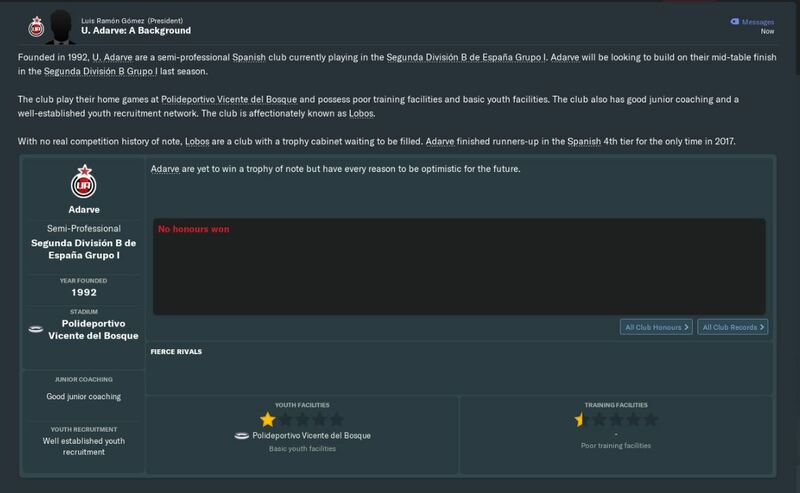 We have been promoted to La Liga 123! End of season stuff now and what a season! Player of the year goes to the retiring Gerardo Berodia. Goal of the year is Portillas effort way back in January. Signing of the season goes to January signing Mikel and young player of the year goes to Munoz, who didn’t actually play that many games. Dressing room atmosphere is good and finally, finally the players are on board with me as the manager. The clubs rep has gone up a bit which is no surprise considering where we were expected to be and what we’ve achieved. 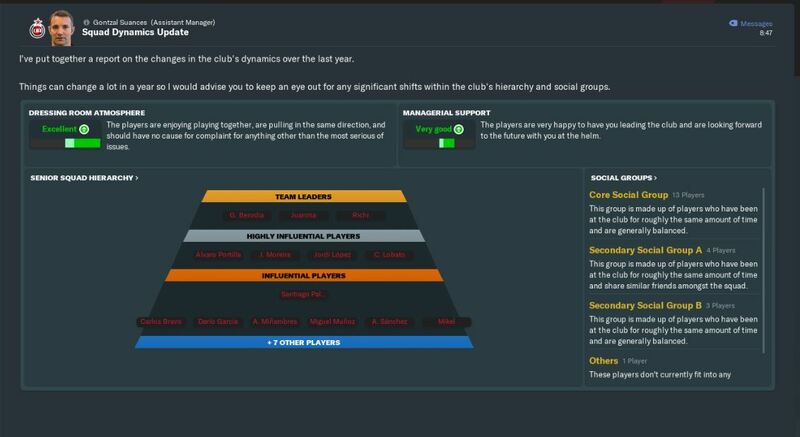 Part of this challenge is to become favoured personnel at 3 clubs, and I can knock 1 off that list thanks to Adarve liking me! How many times can I say wow? Like seriously how many? How did we pull this off?!? This is a small club that shouldn't have won promotion, not this season. I'm so overjoyed it's unreal, the hard work is coming though as next season we're going to be looked at by every other team as 3 easy points. There's not much money here so the signings we target are going to have to be the right ones, no way we can have any passengers, next season is going to be a tough ask, but I love a challenge and that's exactly what next season is going to be! Next update will be pre season stuff for our first season in the next division, the start of the new season and anything else of note.